just finished the next drawing. Don´t know if I got those trainable phased arrays right. Anyway hope you like it and please continue pointing out errors you find. I also added the aft VLS on the baseline design drawings in above post. I also drew a version of the baseline model at the same length (143m) as the Westinghouse model version Santi posted above. Make sure to visit the Shipbucket Collection and our new Shipbucket Forum. It is nice to see how ships I barely remember "come to life". NAAWS was a US-led project to replace the existing Sea Sparrow system. The primary requirements were quick reaction and multi-target handling, to deal with salvos (saturation attack) of very fast (supersonic) low-altitude weapons but also to counter steep divers. NAAWS was conceived to be a secondary system (Aegis being the primary) for ships intended primary for other than pure AAW purposes. The system had to be relatively small and inexpensive. In contrast to FAMS (which was conceived as a stand alone AAW system), NAAWS was conceived as an Aegis-like combat system, integrated with most ship sensors, countermeasure system and with the ship’s tactical data system. - a vertical launched missile (for very quick reaction, even at short range). GE had recently absorbed the RCA division that build the Spy-1 radar. The team was however build around the FARS radar. Hughes suggested the improved version of its TAS mk 23 as a potential MFR. Raytheon planned to use its quad-packed, tail-controlled Sparrow derivate equipped with a combined X-band semiactive radar and IR seeker. A first sketch published showed a ship with two radars, a relatively low frequency rotating unite to detect and track long-range targets (the sketch seems to show stacked wave-guides) and a higher frequency fixed array to deal with shorter-range targets. After the companies reinstating they planned an S-band MESAR, for volume search and target designation/track and a smaller X-band phased array for target illumination and horizon search. The two would be superimposed on a single rotating mounting. UNISAMS proposed a new missile with a dual-mode active/passive seeker and able to quad-pack into a single mk-41 vls cell. By September 1988, the Martin Marietta and Raytheon proposals had been dropped. However Raytheon protested and by early 1989 it had been reinstated in the NAAWS program. In late 1989 it appeared that 2 teams would be chosen for a 4-year demonstration and validation contract in June 1990. " Given the post above I think we can now connect the available pictures to those project teams. The ship Santi posted (with the trainable phased arrays fore and aft) is labeled to be the Westinghouse design and was displayed at the US Navy League show 1990. The ship depicted in "Royal Navy Frigates since 1945, Second Edition" must be the GE-RCA design. In Friedman's World Naval Weapons the design, presented at the US Navy League show 1989, is described as having a 4-faced fixed phased array, with 2 illuminators (similar to the Dutch STIR or STING) and an electro-optical sensor between them. Presumably the fixed array would carry out both the horizon- and hemisphere-search (as Spy-1 does) and the illuminators would be slaved as in Aegis. Leaving those two pictures I initially referred to as Signaal design. These fit however the two Raytheon designs described above. The one with the back to back radar seems to be the newer variant (from after the companies reinstating) and the variant with the fixed array the version from 1988. My conclusion is that all those pictures "only" show each project teams approach to NAAWS and that the "Baseline Design" represents the NFR-90 projects team approach to the ship platform itself. The design that you labelled like “NATO NFR-90 HSA Design 1986” appeared frequently in Spanish media in reference to the NFR-90 project in that years. In fact, a frigate design that appeared in “Revista Española de Defensa” (an official media of the Spanish MOD) illustrating an interesting overview of the later defunct Plan Alta Mar (High Seas Naval Plan) showed a lot in common with it. Sadly, I think that I lost that number of the RED…. The design that you labelled like “NATO NFR-90 HSA Design 1986” appeared frequently in Spanish media in reference to the NFR-90 project in that years. Yea, I think it was the most widely used illustration. In fact, a frigate design that appeared in “Revista Española de Defensa” illustrating an interesting overview of the later defunct Plan Alta Mar (High Seas Naval Plan) showed a lot in common with it. Sadly, I think that I lost that number of the RED…. To bad. Please let me know of you find it anywhere. Can you tell me more about the Plan Alta Mar, please? Plan Alta Mar (PAM) was defined in 1990. It was the first naval plan of the restored democracy and was foreseen a 15 years period of execution (1991-2005). The idea was to preserve the size and composition of the Spanish Armada in the eighties but replacing the old types, most of them former US Navy vessels 40 or more years old, with modern and locally built ships. It was a rational plan, supported by both the socialist and popular (conservative) parties and coherent with the economic situation of that moment. It left behind some ambitious projects seriously considered years before like the building of 3-4 SSN of Rubis type or a second CVS of PdA class. - a force of 15 “oceanic escorts” (frigates). 5 Baleares/F70, 6 FFG/F80 (4 already built + 2 more effectively built in 1994), and 4 F-100 (1997-2000). Those “F100” were 3.500 t “inexpensive” ASW frigates with a design that seems derived (thought reduced in size) with some of the NFR-90 designs. They would replace the ancient Gearing FRAM-I. For the 2000-2005 period was foreseen a class of 5 “F110” (other sources said “F90”) more complex and AAW oriented ships destined to replace the Baleares. - a force of up to 10 submarines, replacing the 4 Daphnes/S60 with 4-6 S80, may be derived from the Agosta/S70 class and similar to what later became the Scorpene. The 4 boats would must be in service in 2000-2005, with an additional couple some years later if the budget was enough. - a force of up to 16 MCM. First 8 minehunters, later 4-8 minesweepers. The actual 6 Segura class are the remains of the “8 minehunters” once the building of the last 2 were delayed sinedie. - 5 amphib vessels: 1 LPD + 4 LST or something similar. They would be a some limited ships for the modern standards because the PAM accounted “a total of 20.000 t for the 5 vessels”. - only 1 AOR, that became the A-14 Patiño, a bit scarce to support 15 frigates! The CVS (R-11 PdA) and the 6 “Coastal Escorts” (the Descubierta corvettes) remained unchanged and the AOL A-11 Marques de la Ensenada was ordered in a hurry like a provisional measure, entering in service in 1991 (Armada was using civil oil tankers since the retirement years ago of the ancient AOL Teide). …. but, the wall, and later the USSR, collapsed, submarine menace nearly disappeared, others appeared, the situation changed. Spanish economy in the nineties got worse, delaying some of the programs, but from 1997-98 it boomed (up to now), allowing others more ambitious….. and PAM were progressively replaced by Strategic Defence Revisions and Armada General Drawings more concerned with operative demands than with concise numbers of ships. I recalled reading of this plan in the convays book...It also had some details of older plans, and in those, particullary the ones preceding the principe de asturias mentioned some cruisers (I got the impression, that the idea was revisited for sea controll ship). I've always wondered what those would have been like....helicopter carriers or real cruisers Also, I once read in somewhere else that Spain was also offered Essex class carrier in place of the Dedalo? If it isent too rude threadjacking, Is there anything more detailed about these considerations? 6 FFG/F80 (4 already built + 2 more effectively built in 1994), and 4 F-100 (1997-2000). I have wondered, were those extra two F80 procured because of the delays in the NFR-90 program or was that decision not connected at all to those events? A similar thing happened in Germany btw. Originally it was planned to build 12 Nato Standard Frigates (F122 Bremen class) in two batches of six each. When enrolling in the NFR-90 project it was hopped to build more of those instead but due to the delays a further two F122 and later four national designed and build F123 were ordered instead, reducing the number of needed NFR-90 to 3-4 in total. I also read somewhere that the F110 "project" evolved into a land attack ship after the decision to "upgrade" the F100 from an ASW into an AAW platform. Any truth in that or just wishfull thinking? It also had some details of older plans, and in those, particullary the ones preceding the principe de asturias mentioned some cruisers (I got the impression, that the idea was revisited for sea controll ship). I've always wondered what those would have been like....helicopter carriers or real cruisers Also, I once read in somewhere else that Spain was also offered Essex class carrier in place of the Dedalo? During Franco dictatorship there were different naval plans. Some of them unrealistic, like the one in the first forties that foresaw 4 battleships of the Roma class, 2 battle cruisers, 36 destroyers, or something like that, I don’t remember the precise numbers. Carrero has great influence on Franco but, thought Spanish economy was growing fast those years, the plan was impossible. May be its intention was to warn on the great weaknesses of Spanish Armada. But some general drawings of the Carrero’s Plan were followed, counting with the help of the US: The Cabot/Dedalo CVS, 5 FRAM, 4 Guppy-II, 12 MSC, 3 LST and, of course, the support on the Baleares program. In those years the “English way” was discarded (Leanders and, may be other types of ships) in attendance of political conflicts and “French way” was selected for the future submarines. It’s true that an Essex class and two Independence were offered to choose, but the first was rejected and, of both Independence, Cabot was preferred. I think that it was a wise decision. Operating a 40.000 t CATOBAR and its corresponding airwing seems a big burden for the Spain of 60's and 70's. Harold Wilson was the main reason for get out the british way for the navy with his refusal to the sell of Leander frigates to Spain, so the Navy had only one way, the US and the modified knox frigates, known as Baleares. 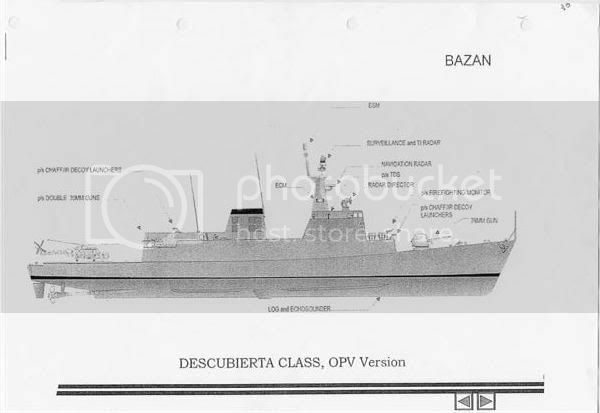 We made 8 Descubiertas, but the last two were "sold" (the payment is not very clear) to the egyptian navy almost inmediately, and the Navy got the promise of the fourth FFG instead of the two corvettes. Yes, the F-85/86 were a preventive measure on the delays of NFR-90 and, of course, were later included in PAM. Interesting. I wonder if M frigates were the Dutch alternative solution or it was a previous program. In any case that isn't related to PAM (“land attack ship” seems a more recent concept). Once the definitive F-100 program was on course “F-110” became simply a name for a future replacement of the F-80’s, following a numeric logic. I doubt that any serious studies on it were made. Nowadays if you ask to most of the Armada officers what they want to replace F-80’s they would say “more F-100”. There is a total commitment with very capable AAW ships. Land attack assets would be TLAM and 5 inch guns, beginning with F-100’s themselves. If other land attack stuff, a second helo, UAV’s or something like that is considered in the future it would be preserving AAW capabilities (It seems that Navantia has a preliminary design of a 9.500 t DDG ). I don´t think so though my initial idea was the same. That´s why I asked about the F80s in the first place. My understanding is that the 5 M-class unites originally were to replace the old Roofdier (US PCE-821) class. The project began in the late 70s/early 80s before or at least at the same time as the NFR-90 (which my guess is would have replaced the van Speijk class). Same is true I guess for the first 6 Halifax class ships and for the first 10 (?) Duke class frigates. Nowadays if you ask to most of the Armada officers what they want to replace F-80’s they would say “more F-100”. lol, my guess is that the price tag would make that unrealistic. Any news on the sixth unite, btw.? Personally while I can understand the decision itself and the benefit for the Spanish export industry I´d still have preferred an APAR/Smart-L version of the F100. How about a hi-low mix fleet for the future with six F100 and six LCS type ships replacing the F80? -more F-100, may be improved "flights", but built at slow pace. A bit like the Burkes in the US Navy (Have I comment the admiration devoted to the US Navy by Spanish Armada? ). -a new class of vessels not before 2020, once some actual programs (F-100, S-80, BPE, BAM) were payed for. One or two month ago a "gremling" on Navantias web showed some scarce references and inactive links to a "9.500 t DDG", "Avante family of frigates", "30.000 t AOR", and other things. If you know any place or have any pictures of Spanish "Newer wheres" of the post war period I would be greatly preciated. One that has been on my mind, is the "Enlarged Descurbierta" class with possible helicopter hangar that was mentioned in Convays book. Imaging a bit larger Descubierta (2.400 vs 1.600 t) with the Bofors LR-375 replaced by an Albatros/Aspide launcher (same disposition like in MMI Maestrales) and a telescopic hangar aft, replacing the 40 mm’s and missile launcher there. 40 mm’s would be relocated both sides of the hangar. All other stuff reminds unchanged (76mm, Harpoon, Mk-32, WM-25, DA-05…). It would be a ship very similar to Italian Lupos, but with CODAD propulsion and w/o 127 mm. It exists at least an artist view of this design but I googled for it without success. For comparison, take a look to the hangar configuration of the Descubierta derived OPV offered to Turkish CG some years ago. I'll search in the deeps of my PC for some other Spanish "Newer wheres"
i am a Swedish researcher who would appreciate help with the identification of the following companies that were included in the Westinghouse NAAWS group. It could take me many hours of googling, it appears. So, from which nations are/were the following companies: MCR, ORI, MEL Vitro and SPAR? Thanks for your help. The best thing for me would be to also mail me at martin.lundmark@hhs.se.